They seem like the perfect killing machines: taking the form of their latest victim as they move on to hunt their next meal, blending invisibly into chaos of human civilization. But as the human race becomes aware of the invaders, the rules unexpectedly change. Because, while the predators may be far more deadly individually, human beings hunt in packs… and no species in the universe has spent more time perfecting new ways to kill than man. As the military secretly mobilizes and a shadow war erupts, Shinichi and Migi find themselves trapped in the escalating purge. Born from a merging of both sides and yet belonging to neither, the best they can do is merely hope to survive as the lines between friend and foe cease to exist. 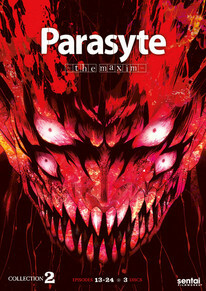 The war between the planet's two apex species spills into the streets as human sheep reveal the wolves hidden inside in the apocalyptic second collection of PARASYTE- THE MAXIM! Parayte - the maxim Collection 2 contains episodes 13-24.